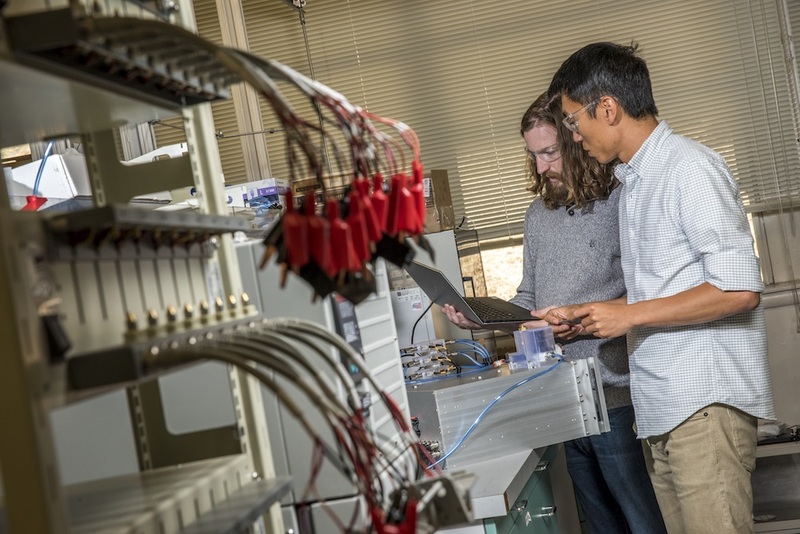 Feasible cofounders Barry Van Tassell (left) and Andrew Hsieh (right) at Berkeley Lab. Feasible, led by Cyclotron Road innovators Andrew Hsieh and Barry Van Tassell, was recently awarded $1,800,000 by the Advanced Research Projects Agency - Energy to continue development of their acoustic battery diagnostic technique. The award will support Feasible to build a functional prototype integrating its hardware and software, and to gather industry feedback about how this technology can relieve customer pain points and improve quality control screening and process monitoring during battery development and production. Part of its AMPED program, the award builds on prior ARPA-E funded work done by Hsieh and Van Tassell along with their cofounders Shaurjo Biswas and Professor Dan Steingart at Princeton University. Congratulations to the Feasible team!